Learn from the Best! Angela Christine is Coming to Fort Lauderdale!! If you are a stylist in today’s industry, you know that your success depends not only on your experience, but on your ability to stay aware and skilled in current trends and techniques. Professional development is key to maintaining a happy clientele. There is a professional development and networking opportunity coming to Fort Lauderdale that you absolutely should NOT miss! 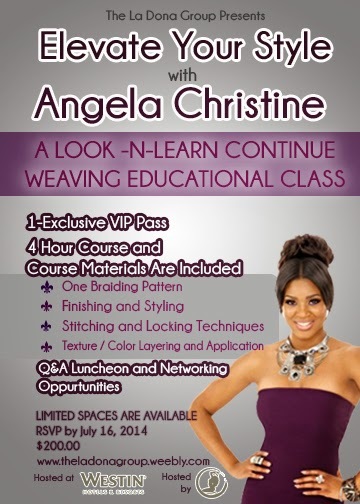 Angela Christine, of LA Hair fame, is bringing her workshop to the Westin Hotel on July 20th. That’s only 2 weeks away! Angela Christine Stevens is a Chicago native currently working at the world-famous Kimble Hair Studio in Los Angeles, California. She has studied cosmetology as far away as Italy and successfully competed all over. Angela originally built her clientele in the challenging Chicago market; where she developed a reputation for giving clients natural looking and long lasting extensions. After spending time travelling the country to offer workshops and work at tradeshows, she moved to LA to further her skills. Kimble Hair Studio offered the incredible opportunity to work with and for the Hollywood elite, and Angela worked directly for Kimberly Kimble. With a front row seat to see all the new hair techniques and trends, Angela successfully services a full clientele in Los Angeles as well as Chicago. Angela is bringing all of her experience here to Ft. Lauderdale to do a one day workshop and luncheon that no professional or future stylist should miss. Go here for more information, and we hope to see you on July 20th! !